Every now and then the day job gets too much. On those occasions - and when the yearning to write creatively grows in my belly - I'll chuck it all for a week and head to an arts center. I'm sure there are such places in the States and elsewhere, but because I've been here so long, I'm not too familiar with the American varieties. 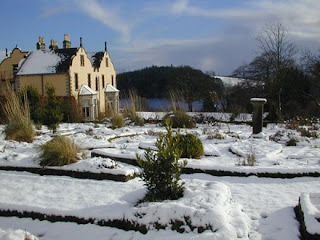 Here in Ireland, and on such occasions, I'll throw my laptop and some survival gear into the car, and head north to County Monaghan and the Tyrone Guthrie Centre. The residence, located in the small village of Annaghmakerrig in said County, is a little peace of tranquility. "This residential workplace (and I quote from their website) is open to professional practitioners in all art forms.... In a tranquil, beautiful setting amid the lakes and drumlins of County Monaghan everything is provided for including delcious food. Sir Tyrone Guthrie bequeathed his family home and estate to the State (e.g. Ireland) with the proviso that it be used for the benefit of artists. It was an inspired decision..."
Inspired is right. You should see this place, and the above photo almost does it justice. The great house, left to Ireland and its artists in 1971, is a virtual paradise. Located in a tranquil surrounding, surrounded by hills and forests, and resting on the shores of a modest lake, it is the perfect place to spin yarns, tell wild stories, create music, proffer jokes to other artists, and otherwise attempt to get some creative work done. It is a veritable paradise for practitioners of almost any art: a range of studios are available for painters and pot throwers; a full sized dance floor is on offer for those with a bent toward ballet or modern or jazz or Irish traditional. The music room comes with a full size Grand Piano. And us writers know that a desk is available in each room with light, and electricity, and a whole lot of time and solitude within which to go creatively crazy. But the house has its share of ghosts, let me tell you. And on many an occasion I've felt the skin crawl, swearing that some long-dead visitor has decided to give me a helping hand with a particular story. Of course, there was one night not too long ago. I'd come to the Centre to work on a horror screenplay, Banshee. Ghosts and bloody ghouls were swirling through my head anyway. And as I was working on one particular scene - a scene in which the full moon rose and the Banshee wailed, I happened to glance out the window. I'm going back to the Guthrie Centre soon to work on a new screenplay that I'm considering, and to write a companion book to A Survivor's Guide to Living in Ireland - this time a travel book with the tentative title: Yarns from a Wandering Yank. While I'm there, perhaps I'll bring all of you along too. You never know. Together, we might see the full Moon rise and the screech of the Banshee as it washes over the dark and lonely Irish countryside. It sounds like a wonderful place. I have always wanted to go to an artists retreat and work on my novel. Wouldn't ot be loverly to combine it with an Irish vacation? Maybe some day I will see you there!